Proper lubrication is integral to ensuring the functionality of components and systems within heavy-duty machinery. While manual lubrication is still the norm in many applications, use of automated lubrication systems (ALS) is becoming a more prevalent alternative to help minimise downtime, improve overall quality and safety through preventative maintenance. With an ALS, lubricant can be applied exactly when and where it’s needed while the machine is running. Manual lubrication, on the other hand, requires the machine to be stopped before lubricant can be applied, and may require a person to climb onto the machine which can be a safety issue. An ALS consists of a reservoir containing grease or other designated lubricant and an electric, pneumatic or hydraulic pump which activates the system to deliver lubricant from the reservoir to the desired location within the machine. 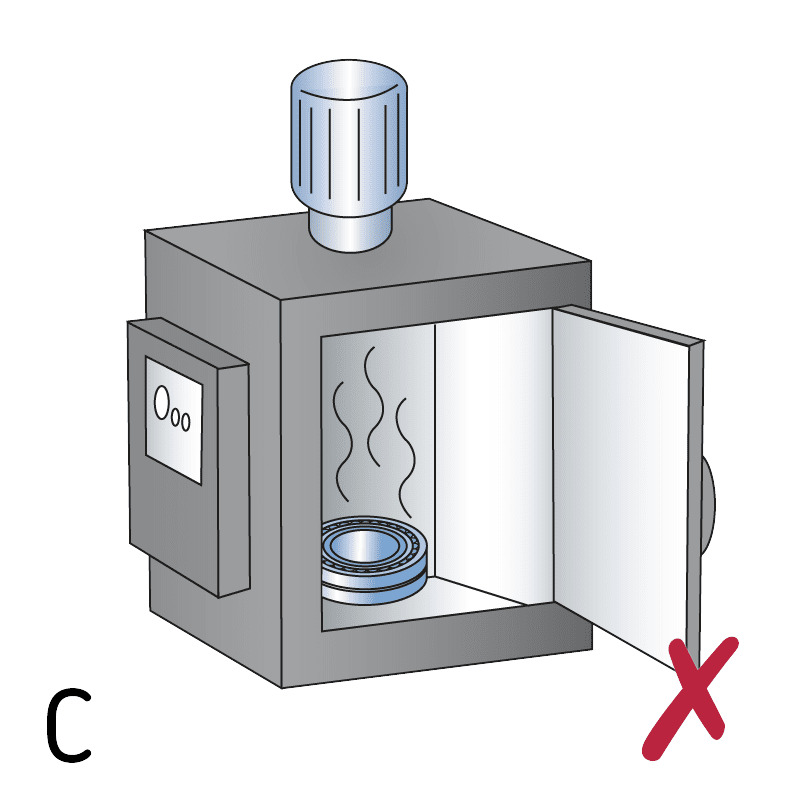 Depending on the design of the machine, lubricant can be dispensed to as many as 100 or 200 different points. A series of metering valves are used to apply the lubricant in the desired location at the exact time lubrication is needed. The system knows where and when to apply lubricant due to built-in controls. If the ALS is integrated into a machine at the factory, the system can be controlled by the OEM’s programmable logic controller (PLC). The appropriate lubrication intervals are programmed into the PLC, enabling it to turn on the ALS when necessary. 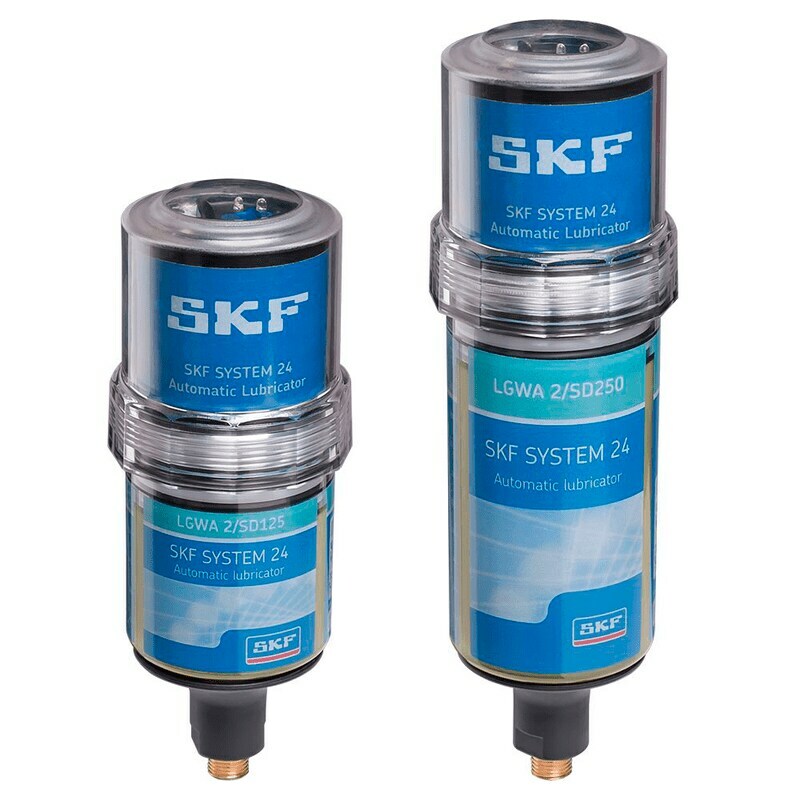 SKF also designs controllers which can be built into the system if it is added to a piece of equipment at the aftermarket level or another point along the OEM channel, such as by a dealer. Laucis says these controllers can provide simple on/off control or be more sophisticated through the inclusion of sensing devices to provide operators with information about when lubrication cycles are occurring, fault indicators and performance attributes. Single line parallel and progressive are the two main types of lubrication systems used within heavy-duty mobile applications. A single line parallel system consists of a reservoir and a pump connected to a bank of injectors by a single hose line. The injectors are lined up in parallel with one another, like fingers on comb, and each of the injectors function independently of one another. By doing so, each injector meters the exact amount of lubricant required and can also be adjusted independently if necessary. The independent functionality is beneficial because if one bearing fails or gets blocked in some manner, it will not adversely affect lubrication of other bearings in the machine. “People like the single line parallel because they can lubricate the entire machine of, let’s say 120 points, and when a couple of those points fail, they’re still getting lubrication in the other systems,” says Laucis. He notes these systems are often used in heavy mining equipment due to the need to minimize downtime as much as possible. It can also be used in construction equipment to avoid poor operator maintenance and in agricultural equipment for safety and bearing protection. He says this type of system is typical for medium-size machines such as those used for highway construction because customers like that a fault indicator will come on when a blockage occurs, letting them know to check the machine at the end of the work day. 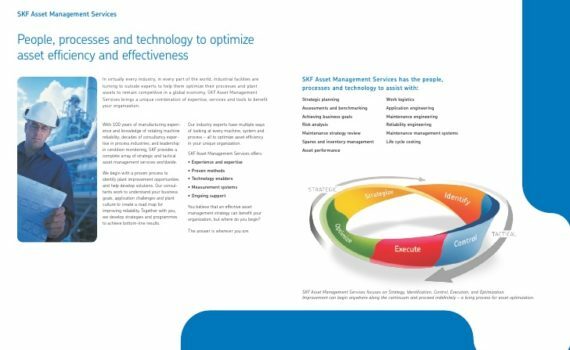 While downtime is a concern, it is not as important as in mining operations where even the smallest amount of downtime can adversely affect productivity and thus profit for the customer. Multiline systems can also be used in off-highway machinery. This system consists of a round housing with several points—up to 20—coming out of it, each of which goes to an individual bearing or other component to lubricate. The system is designed to simultaneously feed several points within a short distance. Laucis says this system is typically used in smaller, less heavy-duty applications due to the fact that it’s not necessarily the most cost-effective option. Since the system is limited on how many on points it can feed, a larger machine would require several systems to be installed, whereas the single line systems are more modular and better able to feed a larger number of points from a single source. Use of an ALS is becoming more prevalent within the heavy equipment industry, however, Laucis says it can be difficult in some applications to compete with an individual who manually lubricates a machine. 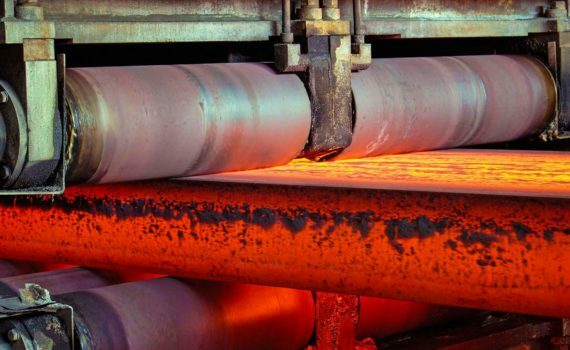 In large, heavy-duty machines—such as mining equipment—he says there is a high rate of adoption because much of the equipment is automated to maintain performance levels and eliminate or minimize downtime, which can be aided by an ALS. He says safety is also a factor for increased use of these systems in heavy machinery. “People are becoming really safety conscious. They are preventing or minimizing the environments where there’s danger, and lubricating points on a machine is a safety issue.” Eliminating the need to manually lubricate parts of the machine ensures a person will not have to climb all over the machine—which may be covered in dirt and grease—and risk possible injury. “You also have mechanical shut off devices, automatic sensing for high/low level grease levels,” says Laucis. “All these accessories are now becoming more prevalent and required on automatic lube systems because they will promote safe environments, continuous uptime performance and be able to provide a nice clean machine. “In the medium machinery market, where cost per point is becoming more critical, I would say the market is stabilizing and increasing based on the value of performance,” he continues. This is due in part to the ability to add telematics to the lubrication system, enabling customers to receive feedback on performance and servicing like they do with other systems in their machine. 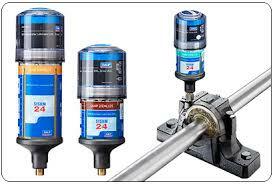 Increasing safety has also caused the rising use of automated lubrication systems in these machines. On smaller sized machines, Laucis says manual lubrication is still the norm as end users typically have regularly scheduled maintenance they perform, making it easy to have lubrication be a part of that maintenance regimen. However, he does see the rate of adoption for ALS increasing in this segment, as well. Whether the system is installed at the OEM or aftermarket level is also dependent on the type of machinery in which it will be used. On larger machines, the OEM tends to install the ALS at the factory. As machine size starts to decrease, the use of auto lube become options depending on the customer preferences and use of the machines in their environment. OEMs look to a strong aftermarket “pull” by their customers to standardize their ALS factory fit systems. On the aftermarket side, he says it’s important to look at what value there is for the customer to add the system, such as safety and performance benefits. For a rental fleet, the case could be made for using the systems to help maintain inventory. If a rented machine comes back and is not performing as it should, the ALS’s data logger can verify whether or not the machine was properly lubricated to help narrow down what may be causing the issue. Laucis says having strong aftermarket support and proof of ROI on the end user side can lead to an OEM seeing value in integrating the system at the factory. An automated system is able to provide that continuous lubrication, whereas manual lubrication would require a person to stand by the machine while it’s running and move a grease gun to every point requiring lubrication, and apply grease every minute says Laucis. Often times manual lubrication is completed at the end of the work day or week, and the lubrication point is flooded with grease or the worker only applies a few pumps of grease and then goes about his or her business. This causes long intervals between lubricant applications, which he says is not the best way to prolong the life of a bearing. “And that’s the philosophy of automated lubrication versus other methods that has to be sold and promoted to maintain machines on a longer level,” says Laucis. 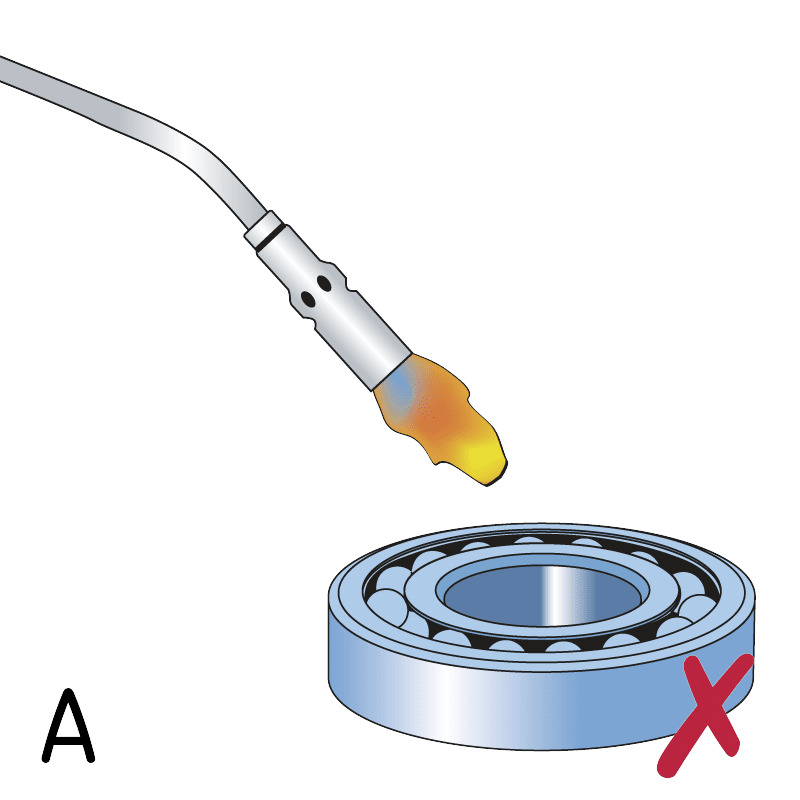 Through the use of an ALS, both OEMs and end users can benefit from the system applying only the amount of grease a bearing requires and at the exact time it’s needed, ensuring the bearing will perform as designed and machine downtime will be minimized. The original article written by Sara Jensen/OEM Off-Highway can be found here: http://www.oemoffhighway.com/article/12250664/automatic-lubrication-systems-increase-machine-performance-and-reduce-downtime. 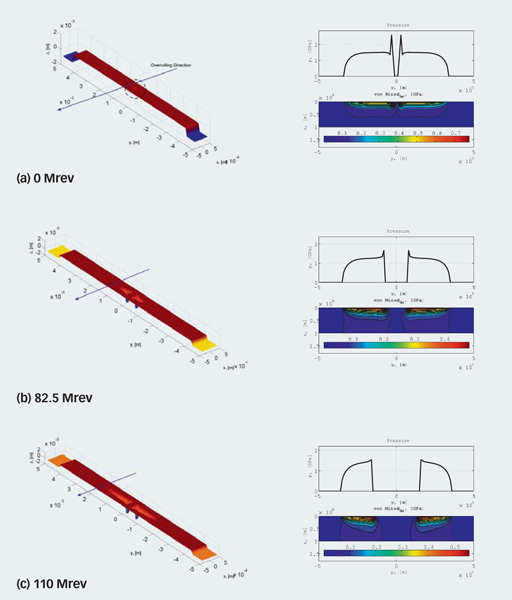 The mechanism of surface rolling contact fatigue in rolling bearings is investigated by means of dedicated experiments and numerical simulations of the damage progression. Rolling contact fatigue (RCF) is a typical failure mode in rolling bearings and similar types of machine components. The fundamental work in RCF is due to Lundberg and Palmgren , . The Lundberg-Palmgren theory was mainly focused on subsurface rolling contact fatigue, and it relies entirely on ideally smooth Hertzian stress calculations. Surface rolling contact fatigue (SRCF) instead involves the area close to the surface of the contact (a few microns deep) that is strongly affected by local surface traction and stresses originated from geometrical features of the surface such as roughness, proﬁle deviations, indentations, etc. 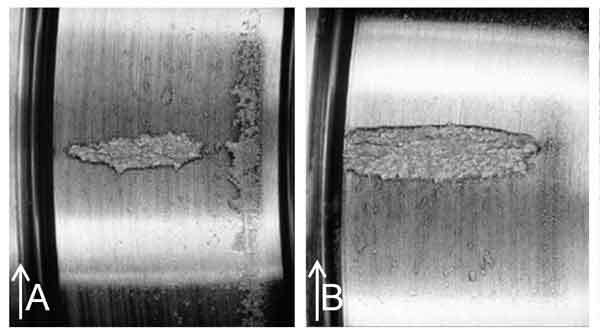 The interaction between the elasto-hydrodynamic lubricating (EHL) ﬁlm and the actual features determining stress risers at the surface is very important in the understanding of surface fatigue phenomena of rolling bearings (Morales-Espejel and Gabelli ). In this article, the progression of SRCF is investigated by modelling the contact and the interaction with deviations of the surface micro-geometry that generate stress concentrations. Comparison of the numerical simulations with a set of experimental results indicates good correlation, allowing the formulation of a hypothesis about the underlying mechanisms of SRCF, as well as its inception and growth in rolling bearings. This new knowledge fits very well with the basic idea behind the SKF Generalized Bearing Life Model (GBLM) that separates surface from subsurface fatigue damage . Often, rolling contact fatigue damage originated around surface microgeometry features develops into a spall. 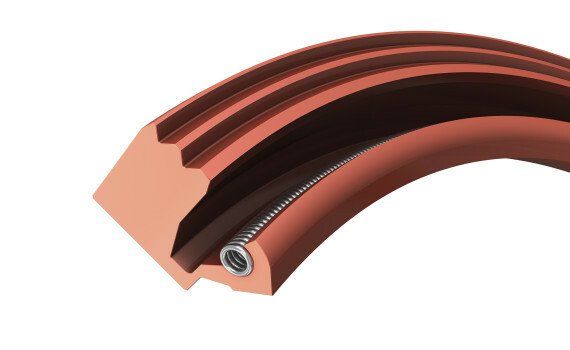 Spall propagation, in its advanced form, is strongly inﬂuenced by macrogeometry aspects – for example, the evolution of the raceway contact geometry and resulting overall stress ﬁeld in a rolling bearing. 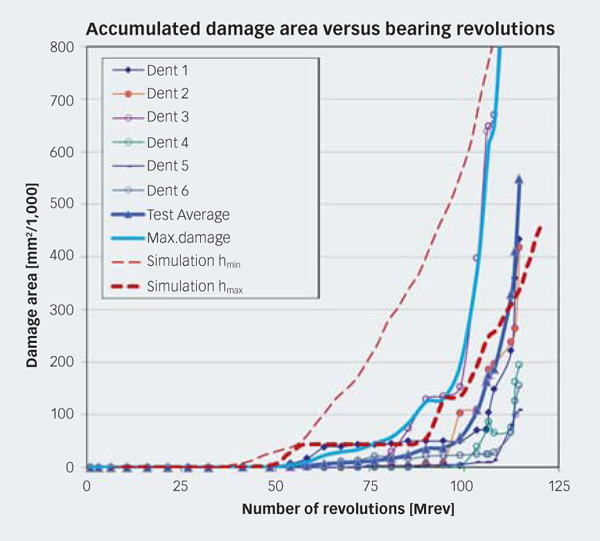 Several researchers have studied spall propagation in rolling bearings in the attempt to associate the mechanical aspects driving the damage progression. 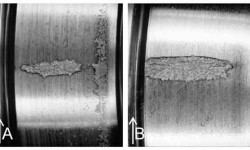 A recent investigation carried out by the present authors  has studied SRCF propagation of predented rolling bearings, both with a model and experiments, concluding that the mechanisms involved in ball bearings require the consideration of lubrication conditions and the interaction of stresses between the surface and subsurface to understand the development of the typical V-shaped cracks along the raceway, differently from the initial transverse damage growth observed in roller bearings that can be explained sufficiently with only dry contact assumptions. 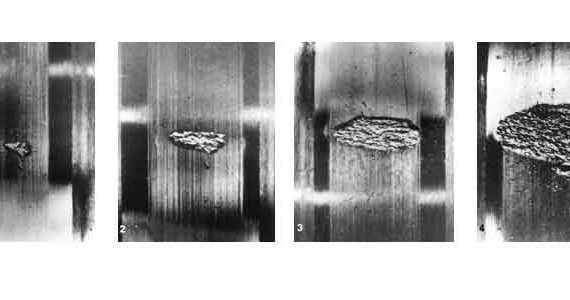 Snare , in his statistical analysis of bearing reliability, monitored the propagation of a spall in a cylindrical roller bearing, showing the clear progression of the damage across the raceway before the spall starts to propagate along the raceway. Fig. 1 shows the experimental tests of Snare. From the theoretical and experimental investigations found in the literature, at least two distinctive spall propagation phases from surface defects are clearly recognized. The ﬁrst one is when the spall grows across the raceway at a more or less slow rate, and the second is when it grows along the rolling path in a more accelerated fashion. The reason for the across-raceway propagation of the spall, in its initial phase, is understood as a consequence of the higher stresses present at the diametral edges of the spall – that is, along the direction orthogonal to rolling, compared to the stresses at the spall leading and trailing edges. The behaviour of the spall inception and propagation on ball bearings (fig. 2) and roller bearings (fig. 3) is strikingly distinct. Surface-initiated spalls in ball bearings initially develop with a characteristic V shape at the trailing edge of the indentation, rapidly growing in the rolling direction with the detachment of raceway material from the V-shaped area. The growth of the spall is observed in the rolling direction, which is the direction opposite to the direction of friction and slip present at that location (fig. 2). Surface-initiated spalls in roller bearings initially propagate at the two sides of the original initiation spot, growing across the raceway before expanding along the raceway (fig. 3). 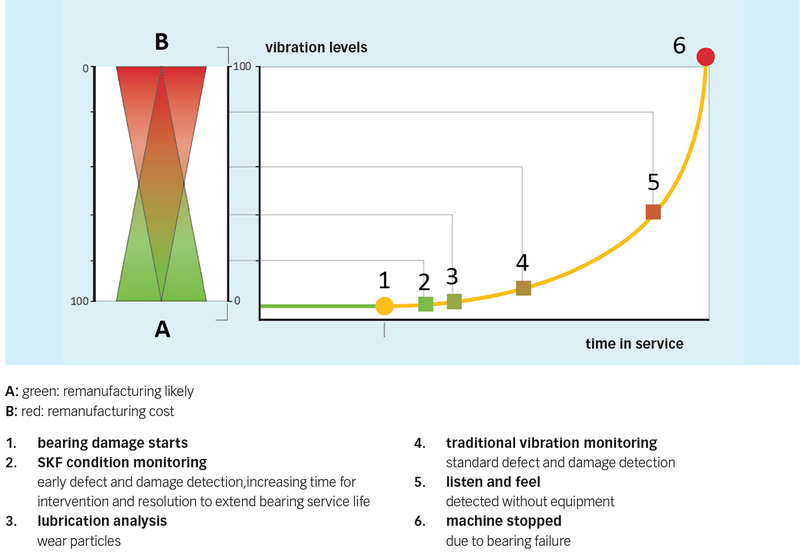 The objective of this article is to shed further light on the progression of surface-initiated fatigue damage of roller bearings. This is to understand via modelling the driving mechanisms behind the damage propagation as observed in the experiments, as a continuation of the work reported by the authors , on the initial damage phase, but now focused of the propagation of this damage. Experiments were conducted on standard tapered roller bearings; see table 1. Tapered roller bearings were artiﬁcially indented using an indentation load of 1,250 N and a 1 mm diameter tungsten carbide ball indenter. This load provided dents with a diameter of 400 µm, 30 µm dent depth, and a raised edge height of about 2 µm. The experiment consisted of eight equally spaced indentations around the circumference on the inner ring of the tapered roller bearings. The dents were also spaced at 0.5 mm steps across the raceway, starting from the raceway edge. However, in this article, only the progression of damage of the dents located at the centre of the raceway will be discussed in detail. 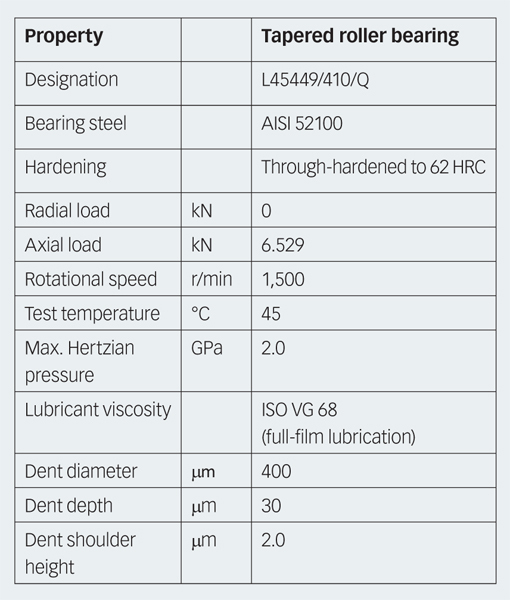 Under the operating conditions given intable 1, the axial load provided a Hertzian width in the rolling direction of about 142 µm, which is substantially narrower compared to the dent diameter. The experiments were run at different numbers of revolutions to observe the progression of the fatigue damage, resulting from the stress concentration and lubrication conditions of the dents. Fig. 4 shows some experimental results about the progression of the dent spalling in the tapered roller bearing for an increasing number of revolutions. The spall initiated at one side of the dent and then progressed towards the two sides of the dent across the raceway – that is, along the direction orthogonal to rolling. In fig. 4(b) an approximated contact ellipse was drawn for comparison with the ﬁnal spall. Several inner rings were monitored by periodic microscopic inspection performed on each bearing, at about 5 million revolutions apart, to detect the initiation and propagation phase of the spall. Each dent was microscopically inspected and photographed as a function of the number of revolutions performed in the test. The initial development and further progression of the spalled area around the dent were measured by digital image processing of the collected microphotographs from several individual dents. The results of this detailed investigation provided very precise information about the initial and progressive growth of the spalling damage area against number of revolutions. All the data collected from the six individual dents that developed spalling damage are shown infig. 5. 1. The incubation time of 50 to 60 million revolutions in which no apparent visible damage can be detected in the bearing raceway; this is about the fatigue rating life of the bearing. 2. 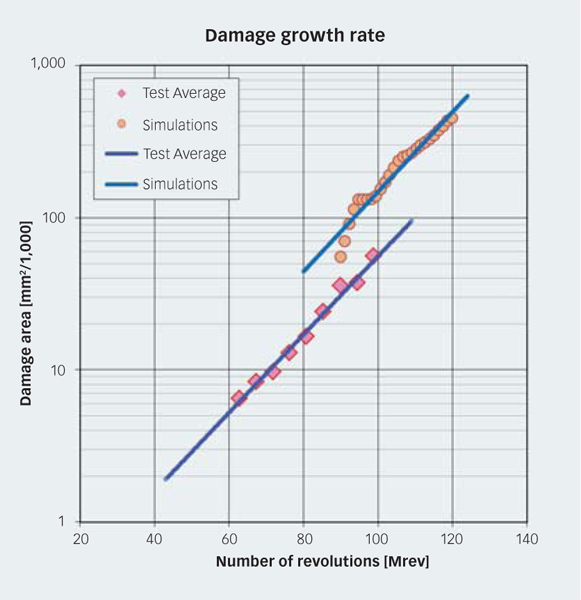 The initial damage progression phase, which extends for 30 to 40 million revolutions, as expected, displays an exponential growth of the damaged area. 3. The accelerated growth. This extends for 20 to 25 million revolutions, during which the growth rate substantially increases (more than twice compared to the previous period). Calculation of the damage in the rolling contact is carried out by modelling in the ﬁrst instance the initial indentation of the raceway. This is done using a parametric analytical function that closely reproduces the shape of the actual dent. The dent geometry is then included in an overrolling contact model to reproduce the Hertzian cycling stress of the actual test bearing. The damage progression calculation is performed using the basic surface fatigue and detachment model developed previously by Morales-Espejel and Brizmer  and fully described there. However, some modiﬁcations and adaptations were also introduced. For instance, the routine for wear calculation, as described in , was switched off to accelerate the speed of the numer-ical simulations. The fast lubrication model is switched off, and only the dry contact model is used for situations where the initial indentation is wider than the Hertzian contact in the rolling direction, which is the case for the simulated tapered roller bearing of fig. 4(a). The model is then used in the calculation of the overall pressures and stresses. This approximation is valid because in this case the lubricant is likely to escape from the dent and contact. No generation of hydrodynamic pressure is to be expected at the dent edge region whose pressures can therefore be modelled using the dry contact hypothesis (for ball bearings with wider Hertz contact area, the lubrication model cannot be ignored). Once the contact pressures are calculated, the stress history is obtained for a series of time steps designed to simulate the passage of the indentation through the rolling contact (see ). From this multistep simulation process the fatigue stress history can be computed for further processing by the fatigue criterion in order to estimate the fatigue damage accumulated from the start to the current load cycle. This scheme follows exactly the same data processing introduced by Morales-Espejel and Brizmer . 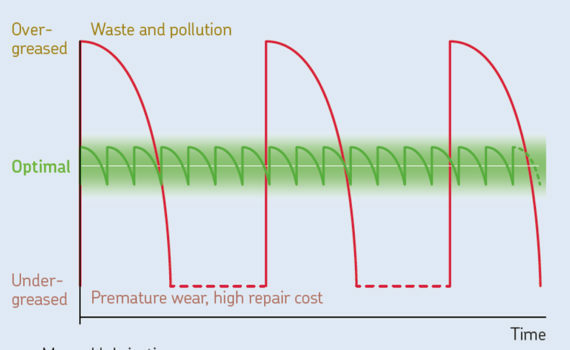 The total damage accumulated up to the current load cycle is calculated following the Palmgren-Miner rule. When fatigue reaches a critical damage value, the possibility of an onset of material fracturing emerges. The current scheme does not have a detailed crack propagation model; the damage propagation is simulated by simply removing fatigued material. For this purpose, a simple material detachment model  was implemented that performs the task of removing the material with accumulated critical damage and material above it. 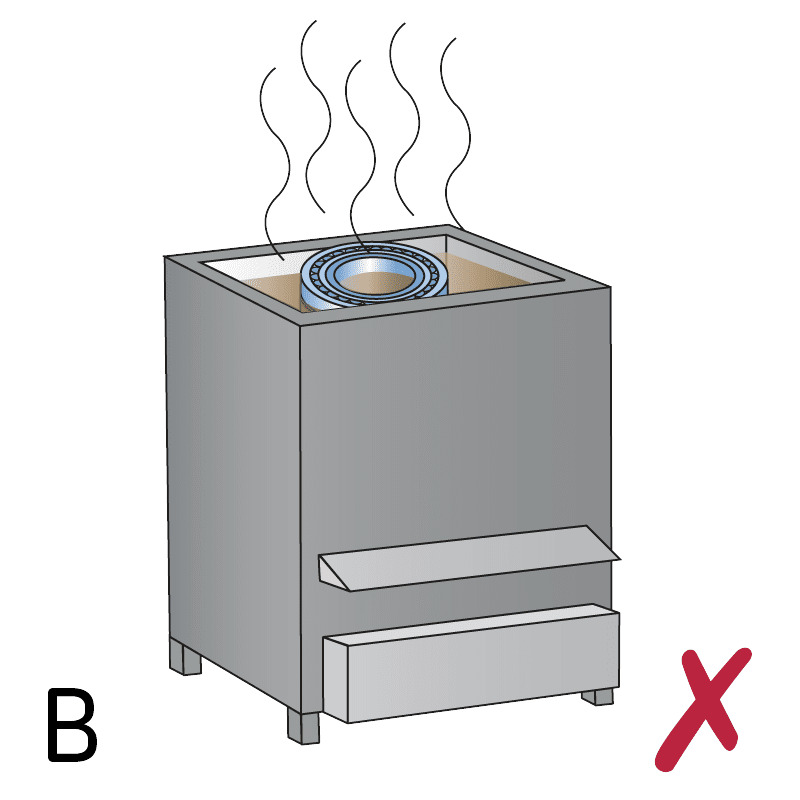 This model contains also a threshold depth (h) from the surface below which material with critical damage is not allowed to detach. This threshold depth can be set up from h = 0 to h = ∞. Setting h ≥ 0 will allow material below the surface to detach. The current model cannot give a precise indication of the damage growth if the parameter h is not known in advance or if some experimental results are not available, but it can very well describe damage growth ranges as will be shown below. 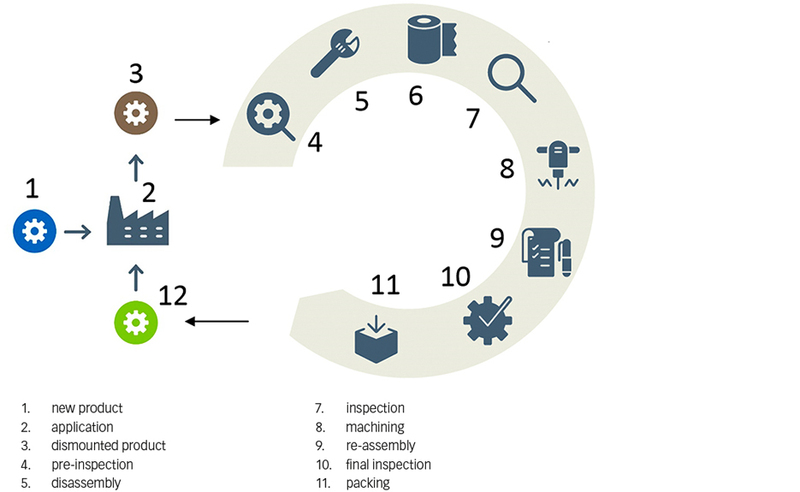 The calculation process is repeated for a given number of load cycles (up to a maximum, typically > 109 overrolling cycles), after which the damage progression history is reported. Test data are given in table 1. In this case the dents are wider (i.e., diameter 400 μm) than the Hertzian contact in the rolling direction (i.e., 142 μm); therefore, it will be impossible during overrolling to develop the required EHL pressure over the dent. This will induce a collapse of the oil ﬁlm at the edge of the dented area. Under these conditions, the effect of the lubricant ﬁlm can be excluded from the analysis, and the progression of damage can be simulated simply using the dry-contact approximation. Fig. 6 shows the spall evolution from the initial indentation for an increasing number of revolutions; they also show the progressive changes of the Hertzian pressure and related subsurface stresses. The results of the numerical simulations clearly show the preferential direction of the progression of the spalled area. The damage starts from the dent lateral edges and progresses in the axial direction across the raceway in a similar manner to the one observed in the experiments (see fig. 4). By computing the area covered by the damage and its evolution with the number of bearing revolutions, it is possible to obtain the curve of the progression of the damage area versus number of revolutions of the bearings. This was computed for two threshold depth levels, h, a minimum and a maximum to characterize the scope of the model simulations (hmin just touching the area of maximum orthogonal shear stress around the dent and hmax well beyond that). The resulting damage progression curves are shown with dashed lines in fig. 5. A thin dashed line is the result of the most conservative setting for the estimation of surface-initiated microspalling – that is, minimum value of the threshold depth. Therefore, the simulated results represent a safe bound of the damage, deﬁning the conditions for the maximum expected damage area from any surface-initiated spall. With the implementation of a maximum threshold depth value, h, the evolution of the damage shown in fig. 5 with a thick dashed line shows a more realistic match with the experimental results. Noticeable is the initial trend of the computed damage area, which shows a stepwise progression clearly matching some of the experimental measurements. This trend achieves a stable growth rate of between 90 and 120 million revolutions; this interval can be compared to the measured initial progression phase of the damage growth of the dent as discussed in the section “Experimental work”. In the simulated results the mechanism of the damage progression is also interesting. Because the indentation is a bit larger than the Hertzian width in the rolling direction, the most loaded zone in the raceway is the lateral area of the indentation, where the damage indeed will initiate and progress. This propagation mechanism can also be found in the numerical simulation showing the lateral edge of the spall affected by the largest surface pressures and subsurface stress concentrations (fig. 6). This type of spall propagation seems to be typical of roller bearings. 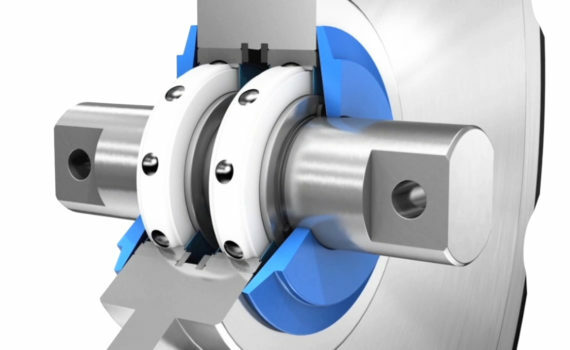 Experiments have been carried out on tapered rolling bearings. The raceways of the bearings were indented with predeﬁned hardness imprints. This created a series of surface stress risers from which surface spalls were originated, allowing the detailed study of their inception and progression. An existing model for surface microgeometry fatigue (Morales-Espejel and Brizmer ; i.e., surface distress) was adapted to study the surface-initiated macro-spalling process. The model was applied to gain better insight into the initiation and early propagation phase of the spall. 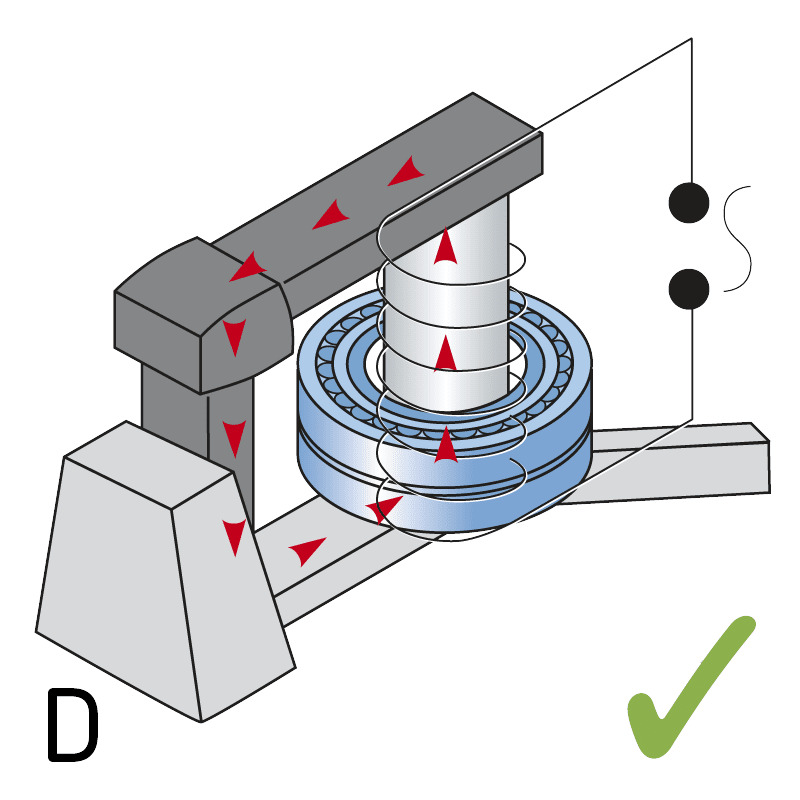 From the computational results it is found that indeed the numerical model can simulate and explain well many of the experimental observations; in particular the experimental results have indicated that in case of the tapered roller bearing, the spall propagates initially across the raceway – that is, along the direction orthogonal to rolling. In general in line-contact bearings, the stresses are higher at the lateral edges of the indentation. These higher stresses drive the growth of the spall across the raceway during the initial expansion of the spall. 1. Pre-indented roller bearings propagate spalls initially across the raceway, driven by the higher stresses found at the edges of the spall along the direction orthogonal to rolling, as previously described in the literature. 2. The presented model describes well the two spall propagation mechanisms. For roller bearing spalls in particular, a good correlation between the model prediction and the experimental measurements is found in the initial spall growth rate. The project was partially financed by the European Commission Marie Curie Industry-Academia Partnerships and Pathways (IAPP) – iBETTER Project. Η αιολική ενέργεια αποτελεί πλέον έναν καθιερωμένο κλάδο. Σύμφωνα με το Παγκόσμιο Συμβούλιο Αιολικής Ενέργειας, στα τέλη του 2014 η παγκόσμια δυναμική παραγωγής αιολικής ενέργειας είχε φτάσει τα 369,6 GW. Το ποσοστό συμμετοχής της αιολικής ενέργειας στην παραγωγή ηλεκτρικού ρεύματος αναμένεται να αυξηθεί τα επόμενα χρόνια, καθώς η ανταγωνιστικότητα έχει πλέον αυξηθεί ιδιαίτερα. Επίσης, η ζήτηση για αιολική ενέργεια έχει πλέον μετατοπιστεί και στις αναπτυσσόμενες χώρες όπου οι ανάγκες για ρευματοδότηση αυξάνονται συνεχώς. Ωστόσο, προκειμένου να μπορέσει να ανταποκριθεί σε αυτή τη δυναμική, η παγκόσμια βιομηχανία αιολικής ενέργειας πρέπει να διατηρεί υψηλά επίπεδα αξιοπιστίας και διαθεσιμότητας. Καθώς ο αριθμός των ανεμογεννητριών που χρησιμοποιούνται παγκοσμίως αυξάνεται, η λειτουργία και η συντήρησή τους μετατρέπονται σε ολοένα και σημαντικότερο τμήμα των σχετικών επιχειρηματικών δράσεων. Πρόκειται για μια πρόκληση που επιτείνεται ακόμα περισσότερο από το γεγονός ότι οι ανεμογεννήτριες εγκαθίστανται συχνά σε απομακρυσμένα σημεία, τα οποία μπορεί να βρίσκονται σε βουνοκορφές ή ακόμα και μέσα στη θάλασσα. Στις σύγχρονες ανεμογεννήτριες, οι τσιμούχες του κύριου άξονα αποτελούν την πρώτη γραμμή άμυνας μεταξύ του εξωτερικού περιβάλλοντος και των κύριων ρουλεμάν και του κιβωτίου ταχυτήτων, που αποτελούν εξαρτήματα κρίσιμης σημασίας. Αυτές οι τσιμούχες έχουν διπλό ρόλο: Αφενός προστατεύουν τα εξαρτήματα της ανεμογεννήτριας από την είσοδο ξένων σωματιδίων, αφετέρου εμποδίζουν τη διαρροή λιπαντικού στο περιβάλλον. Τώρα, οι μηχανικοί της SKF δημιούργησαν μια νέα γενιά τσιμουχών, τη σειρά HRS, η οποία είναι ειδικά σχεδιασμένη για να αντιμετωπίζει τις προκλήσεις της βιομηχανίας παραγωγής αιολικής ενέργειας. Οι μηχανικά κατεργασμένες τσιμούχες πολυουρεθάνης HRS είναι πιο ελαφριές και καταλαμβάνουν λιγότερο χώρο από τις τσιμούχες τύπου “λαβύρινθου”, κάτι που εκτιμούν ιδιαίτερα οι κατασκευαστές εξοπλισμού που θέλουν να μεγιστοποιήσουν την αξιοποίηση του χώρου και να ελαχιστοποιήσουν το βάρος των ατρακτιδίων των ανεμογεννητριών. Διατίθενται σε τρία διαφορετικά σχέδια ώστε να καλύπτουν διάφορες εφαρμογές. Η τσιμούχα HRS1 έχει σχεδιαστεί για να κρατάει το λιπαντικό στο εσωτερικό των ρουλεμάν και του κιβωτίου ταχυτήτων της ανεμογεννήτριας, αντισταθμίζοντας ταυτόχρονα τις μεγάλες αποκλίσεις που παρατηρούνται σε αυτό το είδος εξοπλισμού. Ανάλογα με το μέγεθος του άξονα, οι τσιμούχες HRS μπορούν να αντισταθμίσουν ομοαξονικές αποκλίσεις έως και 3 mm. Στις εφαρμογές όπου η προστασία από την είσοδο σκόνης ή υγρασίας αποτελεί επίσης προτεραιότητα, οι πελάτες μπορούν να χρησιμοποιήσουν την τσιμούχα HRS1 σε συνδυασμό με την τσιμούχα HRE, ώστε να έχουν ένα πρόσθετο εξωτερικό χείλος. Εναλλακτικά, μπορούν να χρησιμοποιήσουν την έκδοση HRSA, η οποία διαθέτει ενσωματωμένο βοηθητικό χείλος. Οι τσιμούχες HRS κατασκευάζονται από πολυουρεθάνη G-ECOPUR, η οποία αντέχει στο όζον, την υπεριώδη ακτινοβολία και το νερό και προσφέρει εξαιρετική υδατοστεγανότητα σε σχέση με τα ελαστικά υλικά που χρησιμοποιούνται συνήθως. Στις δοκιμές, η πολυουρεθάνη G-ECOPUR αποδείχτηκε πέντε φορές πιο ανθεκτική στις τριβές από το αντίστοιχο ελαστομερές υλικό με τη επόμενη καλύτερη απόδοση. Αυτή η ιδιότητά της μεταφράζεται σε μεγαλύτερη διάρκεια ζωής και λιγότερες πιθανότητες πρόωρης βλάβης ή φθοράς. Η πολυουρεθάνη G-ECOPUR καθιστά επίσης εφικτή τη μηχανική κατεργασία των τσιμούχων HRS, ώστε να έχουν εξαιρετικά λεία επιφάνεια. Αυτό σημαίνει ότι περιορίζεται η τάση της τσιμούχας να δημιουργεί εγκοπές στην επιφάνεια του άξονα και έτσι διατηρείται η απόδοση του συστήματος καθ’ όλη τη διάρκεια ζωής της ανεμογεννήτριας. Η λεία εξωτερική επιφάνεια που έχουν αυτές οι τσιμούχες εμποδίζει επίσης τη διαρροή λιπαντικού ανάμεσα στην τσιμούχα και το περίβλημα, κάτι που είναι αρκετά σύνηθες στις πιο σκληρές υφασμάτινες τσιμούχες που είναι εμποτισμένες με φαινόλη. 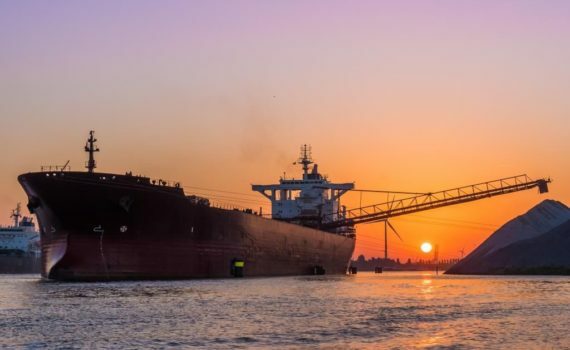 Όλα τα προϊόντα της σειράς HRS διατίθενται σε συμπαγή ή διαιρούμενη σχεδίαση. Οι συμπαγείς τσιμούχες έχουν σχεδιαστεί για εγκατάσταση κατά την κατασκευή, όπου οι χειριστές έχουν πρόσβαση στο άκρο του άξονα. Οι διαιρούμενες τσιμούχες είναι ιδανικές ως εξαρτήματα επισκευής ή για κατασκευαστικές εφαρμογές όπου δεν υπάρχει δυνατότητα πρόσβασης στο άκρο του άξονα. Χάρη στη λεία εξωτερική διάμετρο που έχουν οι τσιμούχες HRS, η εγκατάστασή τους είναι πολύ πιο εύκολη σε σύγκριση με τις υφασμάτινες ενισχυμένες τσιμούχες, δίνοντάς σας τη δυνατότητα να εξοικονομείτε χρόνο και χρήματα κατά την κατασκευή ή την αντικατάσταση. Η προσεκτικά βελτιστοποιημένη γεωμετρία που έχουν αυτές οι τσιμούχες συνεπάγεται ότι το χείλος στεγανοποίησης δεν μπορεί να έρθει σε επαφή με το κυρίως σώμα της τσιμούχας, με αποτέλεσμα να ελαχιστοποιείται ο κίνδυνος αναστροφής της τσιμούχας ή απώλειας του ανοξείδωτου δακτυλιοειδούς ελατηρίου κατά τη συναρμολόγηση. Παράλληλα, η σχεδίαση των τσιμουχών με πιο σκληρά υλικά απλοποιεί ακόμα περισσότερο την εγκατάστασή τους, εξοικονομώντας έως και τέσσερις ώρες εργασίας ανά τσιμούχα σε σύγκριση με τις υφασμάτινες τσιμούχες. Για τις εφαρμογές συντήρησης και επισκευής, οι διαιρούμενες τσιμούχες HRS παρέχονται σε ειδική συσκευασία μεταφοράς που περιλαμβάνει όλα τα απαιτούμενα υλικά για την ολοκλήρωση των εργασιών – ένα θείο δώρο για τις ομάδες των τεχνικών που εργάζονται σε απομακρυσμένα σημεία και έχουν ελάχιστο χώρο στη διάθεσή τους. Οι τσιμούχες HRS κατασκευάζονται σε όλα τα τυπικά μεγέθη, ώστε να μπορούν να χρησιμοποιηθούν σε όλες τις σύγχρονες εφαρμογές ανεμογεννητριών, ενώ μπορούν επίσης να προσαρμοστούν στις ιδιαίτερες ανάγκες του πελάτη. Οι τσιμούχες αυτές διατίθενται ήδη μέσω του παγκόσμιου δικτύου διανομής της SKF, υποστηρίζοντας κατασκευαστές και χειριστές που εργάζονται σε όλα τα μέρη του κόσμου. Επίσης, μπορείτε να τις προμηθευτείτε στο πλαίσιο μιας ενιαίας λύσης SKF που περιλαμβάνει ρουλεμάν, τσιμούχες και λιπαντικά. δυνατότητα εισαγωγής δεδομένων για βελτίωση αξιοπιστίας. Η μείωση των αρνητικών περιβαλλοντικών επιπτώσεων αποτελεί ένα όλο και πιο σημαντικό θέμα για την κοινωνία μας και η ανακατασκευή μπορεί συμβάλλει σημαντικά στη βελτίωση της βιωσιμότητας, μειώνοντας την εκμετάλλευση των φυσικών πόρων και την κατανάλωση ενέργειας. Η SKF διαθέτει δεκαετίες εμπειρίας στην ανακατασκευή. Τα κέντρα παροχής υπηρεσιών που διαθέτουμε, παρέχουν επαγγελματικές δυνατότητες για ανακατασκευή, επανακατεργασία, επισκευή, επιδιόρθωση ή αναβάθμιση βασικών βιομηχανικών εξαρτημάτων και συστημάτων. Η ανακατασκευή στην SKF εκτελείται από ειδικά κέντρα παροχής υπηρεσιών κορυφαίας τεχνολογίας, τα οποία είναι στρατηγικά κατανεμημένα σε όλον τον κόσμο. Στα κέντρα, οι υπηρεσίες εκτελούνται σύμφωνα με τις διαδικασίες και τις μεθόδους που καθορίζονται από την SKF για να πληρούν τις απαιτήσεις ποιότητας και απόδοσης των βιομηχανικών εξαρτημάτων. Μέσω διευρυμένων συνεργασιών, η SKF μπορεί να προσφέρει οικονομικά αποδοτικές λύσεις για τη βελτιστοποίηση της συνολικής διάρκειας ζωής των προϊόντων και χαμηλότερο λειτουργικό κόστος. Οι γρασαδόροι της σειράς TLSD είναι ηλεκτρομηχανικοί αυτόματοι λιπαντήρες ενός σημείου, που παρέχουν λίπανση απευθείας ή εξ αποστάσεως. Γκέτεμποργκ, 15 Νοεμβρίου 2013: Η SKF παρουσιάζει τη νέα σειρά SKF SYSTEM 24 TLSD ηλεκτρομηχανικών αυτόματων λιπαντήρων. Οι νέοι γρασαδόροι είναι αξιόπιστοι, τοποθετούνται εύκολα και είναι κατάλληλοι για ευρύ φάσμα εφαρμογών λίπανσης, για χρήση σε ποικίλο εξοπλισμό, από αντλίες και ανεμιστήρες έως μεταφορικούς ιμάντες, κυλιόμενες σκάλες και γερανούς. Η στιβαρή κατασκευή του νέου λιπαντήρα TLSD είναι ιδιαιτέρως κατάλληλη για χρήση σε εφαρμογές με έντονους κραδασμούς ή μεταβλητή θερμοκρασία λειτουργίας. Επίσης, διατίθεται ειδική έκδοση για χρήση σε χαμηλές θερμοκρασίες. Σε κάθε περίπτωση, το προϊόν αποτελεί αποτελεσματική λύση για τη λίπανση ρουλεμάν, αξόνων και κεφαλών, συμβάλλοντας στην επιμήκυνση της διάρκειας ζωής των μηχανημάτων καθώς και στη μείωση του κόστους συντήρησης. “Ο γρασαδόρος TLSD είναι ένα αξιόπιστο και εύκολο στη χρήση προϊόν. Χάρη στο διαφανές δοχείο, μπορεί να ελεγχθεί η κατάσταση γρήγορα με μια ματιά, ενώ η προγραμματιζόμενη μονάδα κίνησης, με οθόνη LED μεγαλύτερης ευκρίνειας, προσφέρει περισσότερες επιλογές και μεγαλύτερη ευελιξία από τις ανταγωνιστικές διατάξεις”, λέει ο Guus Willems, Μηχανικός Ανάπτυξης Προϊόντων στην SKF. Η σειρά TLSD περιλαμβάνει αυτόνομες συσκευές που αποτελούνται από το δοχείο του λιπαντικού και μια μονάδα με μπαταρία που μπορεί να προγραμματιστεί ώστε να παρέχει λιπαντικό ανά μηνιαία διαστήματα που μπορούν να ρυθμιστούν. Η σύνδεση σε κάθε μηχάνημα πραγματοποιείται είτε με απευθείας τοποθέτηση είτε μέσω γραμμής τροφοδοσίας, που καταλήγουν σε τυπικό σπείρωμα G1/4. Το δοχείο παρέχεται σε δύο μεγέθη (125 ml και 250 ml) με λάδι ή γράσο υψηλής απόδοσης με προδιαγραφές SKF. Η μέγιστη πίεση λειτουργίας είναι 5 bar. Η μονάδα κίνησης διαθέτει απλό περιστροφικό διακόπτη, που προφυλάσσεται με διαφανές πλαστικό καπάκι και προσφέρει δυνατότητα προγραμματισμού του TLSD ώστε να παρέχει λιπαντικό σε επιλεγμένα διαστήματα. Επίσης, η οθόνη LED με πράσινη-πορτοκαλί-κόκκινη φωτεινή ένδειξη, που είναι ορατή από όλες τις γωνίες, δείχνει καθαρά την κατάσταση λειτουργίας της διάταξης. Η χρήση ανοικτής φλόγας (A) για την θέρμανση ρουλεμάν είναι όχι μόνο ανεπαρκής και ανεξέλεγκτη, αλλά και καταλήγει πολύ συχνά σε βλάβη του ρουλεμάν. Αυτή η μέθοδος δεν θα πρέπει να χρησιμοποιείται. Μπάνια λαδιού (B) επίσης χρησιμοποιούνται αρκετές φορές για την θέρμανση ρουλεμάν. Χρειάζονται όμως πολύ ώρα για να φτάσουν στην επιθυμητή θερμοκρασία και είναι δύσκολος ο έλεγχος της πραγματικής θερμοκρασίας του ρουλεμάν. Η δε ενεργειακή κατανάλωση είναι σημαντική σε σχέση με έναν επαγωγικό θερμαντήρα. Ο κίνδυνος επιμόλυνσης του ρουλεμάν από ακάθαρτα λάδια είναι σημαντικός και μπορεί να οδηγήσει σε πρόωρη αστοχία του ρουλεμάν. Επιπλέον ο χειρισμός θερμών και μέσα στα λάδια ρουλεμάν εγκυμονεί κινδύνους για τον χειριστή. Φούρνοι (C) και άλλες θερμαινόμενες επιφάνειες χρησιμοποιούνται συχνά για μαζική θέρμανση μικρών ρουλεμάν και αυτή είναι μια αποδεκτή μέθοδος. Παρόλα αυτά για μεγαλύτερα ρουλεμάν, η χρήση φούρνων και θερμαινόμενων επιφανειών είναι αρκετά ανεπαρκής και χρονοβόρα μέθοδος, ενώ μπορεί και να παρουσιάσει σοβαρούς κινδύνους τραυματισμού στον χειριστή. οι επαγωγικοί θερμαντήρες (D) είναι η σύγχρονη, ασφαλής και αποτελεσματική μέθοδος θέρμανσης ρουλεμάν. Στην πράξη είναι γενικά ταχύτερη, καθαρότερη, σωστά ελεγχόμενη και πιο εύκολη στην χρήση μέθοδος θέρμανσης ρουλεμάν.